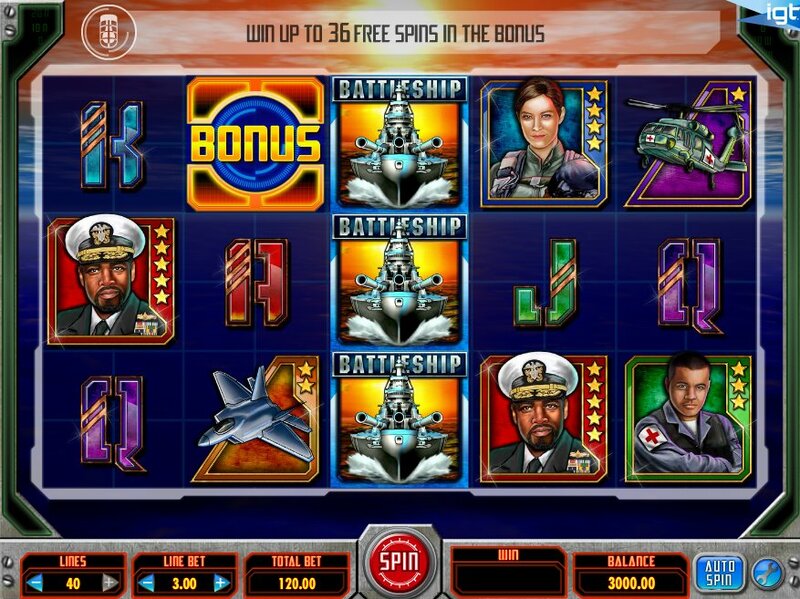 Before I begin, if you’re looking for the Battleship – Search and Destroy slot from the renowned slot developer IGT that was released back in 2009 then you’ve come to the wrong place. This is the slot that isn’t based on the popular family game. This 5 reel, 40 payline slot might have the same name as the popular 2009 release but that is pretty much where the similarities end. 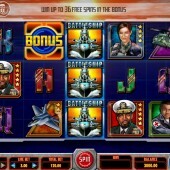 Battleship has the same sort of set up as the iconic Cleopatra slot with the addition of 20 extra pay-lines so if you enjoyed that slot then you will want to get on board this battleship (pardon the pun) immediately. It also gives you a unique chance to quote Grandpa Simpson's friend Jasper by saying "you sunk my battleship" at random points during the game and if that's not a reason to play this slot then I don't know what is! The reels are packed with navy symbols including an admiral, pilot, helicopter, medic, fighter jet and regular 9 through to Ace symbols. The Wild symbol is represented by the Battleship Logo and substitutes for all other symbols to complete winning combinations. Interestingly, there are stacked Wilds present on the reels that reward a 2x multiplier to all winning combinations that they help to form. The main bonus feature in Battleship is the Victory Bonus that is triggered when you hit three or more Bonus symbols across the reels. Once triggered, you are presented with five warships and you must select which warships you want to blow up using the missiles awarded to you. When the warships explode they will then reveal prizes. It is possible for you to reveal up to 36 free spins with the chance to gain a 10x multiplier. This Battleship slot is not exactly one of the most awe-inspiring slots I’ve reviewed recently but it is easy to see how it could become quite an attractive slot to some players. The big wins can be really big but they are few and fair between. You could kind of compare this slot to Everest. The rewards when you reach the top are mind-blowing but the chances of failure are often too high to bother risking the climb.